Our screw machine production equipment includes Single-Spindle CNC Tsugami , Multi-Spindle CNC Tornos, Davenports, Acme-Gridleys, Bechlers, and Escomatics. These single spindle and multi spindle machines allow us to produce most machine metal components from 1mm to 32mm in diameter in Aluminum, Brass, Steel and Stainless. 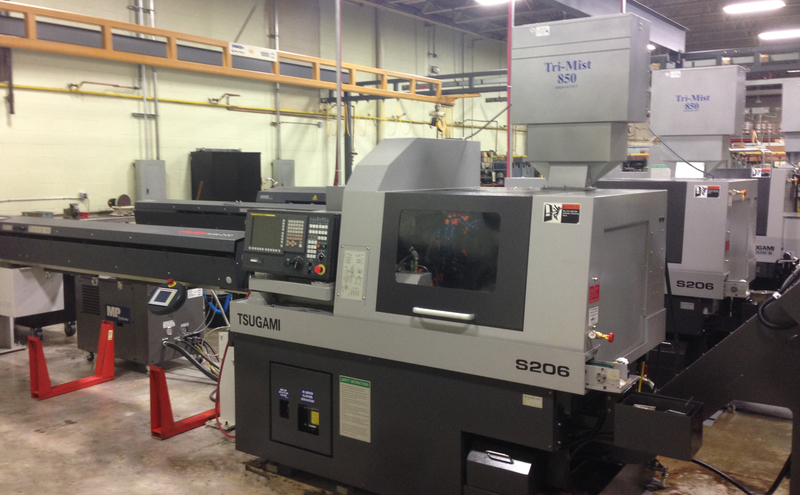 To service our customers in all aspects of machined parts, Kaddis Manufacturing began investing in single spindle CNC Tsugami machines in November 2013. The capacity range for this equipment is .125" (3mm) to 1.250" (32mm). Kaddis Manufacturing has a large compliment of Bechler Single Spindle cam equipment. These machines produce close tolerance (Swiss tolerances) in volumes from one thousand pieces to hundreds of thousands of pieces. These machines use bar stock usually straightened and ground which allows us to maintain tenths of an inch tolerances during production. From a cost viewpoint, Escomatic equipment is one of the lowest cost operations for machining small diameter parts (maximum ¼” or 6mm) to close tolerances. Escomatics use raw material in coil form which translates into less raw material stock ups for the operator. The machine/operator ratio is 6-8 machines per operator which results in an inexpensive hourly rate for this equipment. The parts produced on this equipment are usually simple part configurations with volumes of 50,000 pieces and up. Kaddis Manufacturing made a substantial investment in the “next generation” multi-spindle equipment. We did an in-depth analysis of what would complement our existing line of equipment and found that Tornos had the machine for Kaddis. Using automatic bar loaders for optimum efficiency, this equipment is designed for High Volume, Complex Parts maintaining Tight Tolerances. In 2005, Kaddis Manufacturing upgraded the Acme-Gridley department. Equipment remanufactured to OEM specs was put in place A Tech-Drive system was added for better control over Speeds and Feeds, which can result in a faster cycle time and savings for our customers. Kaddis Manufacturing’s Davenport equipment undergoes a complete remanufacture every seven years by Kaddis personnel. We believe Kaddis is the only machining company that remanufactures Davenports to “Better than New” standards. The Davenport machine is stripped down to the base casting. By using unique proprietary methods and controls we ensure Three Dimensional Alignment on the revolving and stationary heads. We are able to reduce the spindle to spindle tolerance to within ten thousandths instead of thousandths of an inch. This translates into less variation from spindle to spindle or part to part. 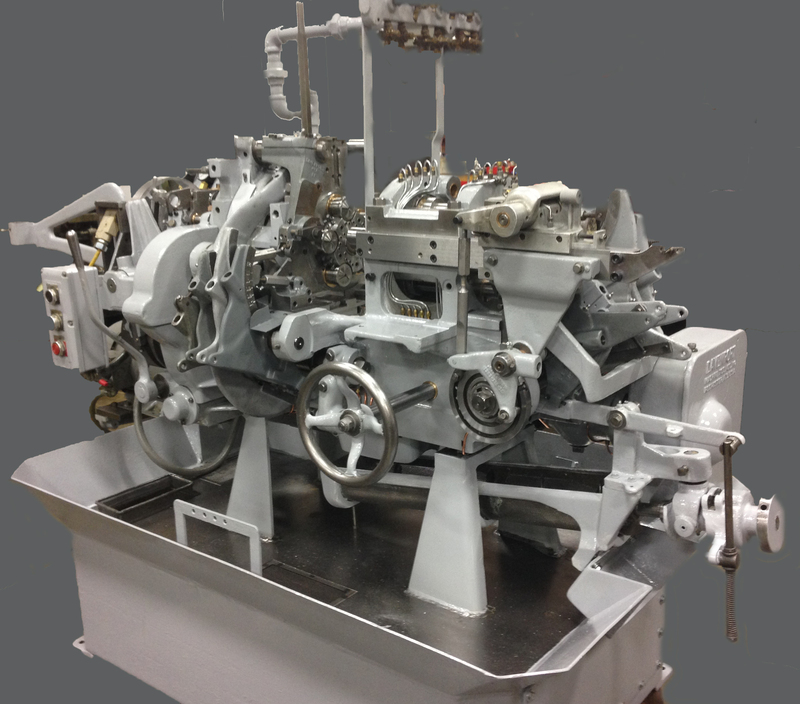 A Davenport machine remanufactured at Kaddis equals Quality Equipment, Cost Contained, and World Class Parts. Davenport Equipment Undergoes a Complete Re-Manufacture every Seven Years. The Machine is Stripped Down to the Base Casting and Re-Manufactured. Unique Methods and Quality Control Ensure Three Dimensional Alignment to "Better Than New" Equipment Specifications. The Machine is Built Up with New Electrical, Bearings, Bushings and Lubrication System. Kaddis Manufacturing has been providing precision machined components since 1939.